Aren’t these pretty? I love the pink one. I had been looking for some parasols for the wedding, but had given up on them because all I could find that were nice were $30 or more! 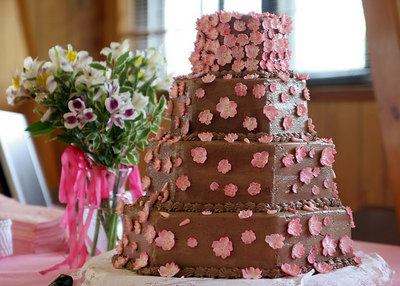 Here’s an inspiration picture of the beautiful cherry blossom cake we are doing! Cherry blossoms are from www.wendykromer.com. And here is how our cake turned out! Thanks to Gideon Studios for the wonderful photograph of our cake! This stamp is so pretty. Probably one of my all-time favorites. 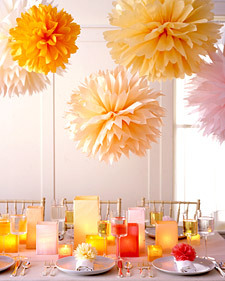 Here is a picture of the hanging pompom craft. I love how the tissue paper looks! We are going to go with a solid pink color though. And they might hang a bit higher. The postcard replies have this .24 butterfly on them. Not the prettiest, but I’ve warmed up to it as I’ve been putting it on the cards. Here is the ring we are going to Tiffany’s to look at for me. I know I love it though, so we’ll probably get it too! Probably will order our favors soon, just need to think of some fortunes or what we want to say. We get 5 free messages. Any suggestions? 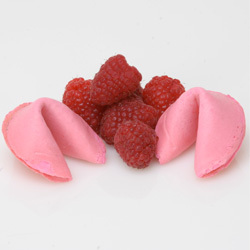 Raspberry Fortune Cookies! You are currently browsing the Handcrafted Delights weblog archives for July, 2006.